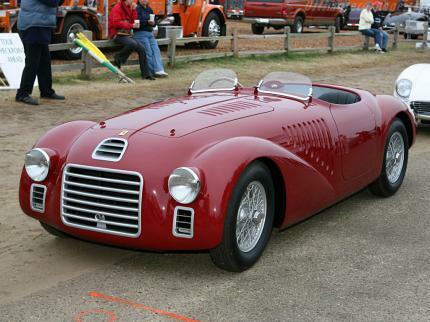 Enzo Ferrari's first road car was a barely tamed race car. But it is a race car. Imagine how much this thing might cost by now. Great design in my opinion. this look's like it's a real production car but if it is a race car that doesnt suprise me to much. they only build two of it and used it only for racing(Mille Miglia) in 1947 it won 6 of 14 races!!!!!! How you can call this production? The best both cars looked completely different..one like the 1980replica the other with free standing wheels with small fender that only covered the wheels..
Ferrari made racing cars before this, but this is their first PRODUCTION car. I relise its a 1947, But...Goddam thats Ugly!!!! wasn´t that a race car?